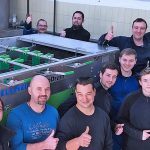 The innovative Emin Leydier Group will receive a complete one-stop system for the dewatering of organic biosludge from the production of recyclable packaging for the food industry. The present Emin Leydier Group was created in 1975 through the merger of Papeterie Leydier (1859) and Cartonnerie Emin (1920). 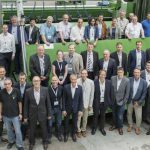 Since then, the company has grown strongly, through investment and innovation, one result of which is the E-natur`El line, identified at Paper Week 2015 in Brussels as one of Europe’s most innovative products. Emin Leydier Group supplies products used widely for industrial corrugated boards in Europe and beyond. The “packaging” and “service” corrugated packaging units are used in France in the wholesale industry, including food. Approximately 50% of the marketed packaging is used in the agro-food industry in, for example, “ready-to-sell” tablets, packs or trays for the fruit and vegetable market. All products are made from recycled and recyclable paper products and Emin Leydier is an important player in its markets. Following a tender process Bellmer Separation was awarded the contract for the “Upgrade WWTP”, after intensive and comprehensive target-orientated process analysis, despite very strong competition. Bellmer Separation offers the most efficient technology available on the market and can supply Emin Leydier a complete system from one source. The scope of supply included the new Bellmer WinklePress Green with high-pressure zone, a BMU for efficient polymer dosing, a polymer station, a transport system with screw conveyor, a walkway, a wash water filter (which can reduce water consumption for belt cleaning by 100%), all pumps as well as control with PLC. Engineering, project management, assembly, customer training and start-up were essential components of the Bellmer project. 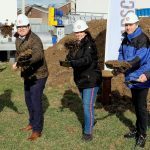 Bellmer and Emin Leydier have together created a unique plant concept that meets the challenge of approximately 19 m³ per hour of bio sludge with dry matter content of 4.5% at the feed. This is 100% biological sludge from the multi-stage waste water treatment with less press stability and a high organic content. Higher final dry solids contents can be achieved thanks to the optimized roller configuration. Bellmer WinklePress Green achieves final dry solids contents of more than 30% DS with the accruing bio sludge mixture. The following advantages of the Bellmer plant are decisive for customers: highest final dry solids contents, fully automatic operation, reduction of belt cleaning water, low operating costs, very low energy consumption and above all highest “Made in Germany” quality. The Bellmer WinklePress Green has been in operation since February 2017, along with all its plant components. The Bellmer concept to supply the complete system from one source has also proved itself here at Emin Leydier. You can get further information about the Bellmer WinklePress here.